Goosaruu’d. Duckaduu’d. | Enough Talk, More Writing! ‘A name dropper? Moi?’ says LA resident Mark Hayes, fresh from a game of soccer at Robbie Williams’s house. ‘Ah, not too bad, thanks for asking. How about yoursel– Oh. Right. Hubbulla. Homeless and unemployed. Yourself?” In LA, people aren’t really bothered with trivial questions such as, “How are you?” Simply: “Who are you?” quickly followed by: “What do you do?” Which is when they then whip out their iPhones and Google your name. LA… Fake? Never! Greetings have started to change whenever I come back to Ireland as well. “How’ve you been?” replaced with “Who’ve you seen?” Vampire-like. Craving celebrity blood. Drip-drop those names. My response varies on who asks. 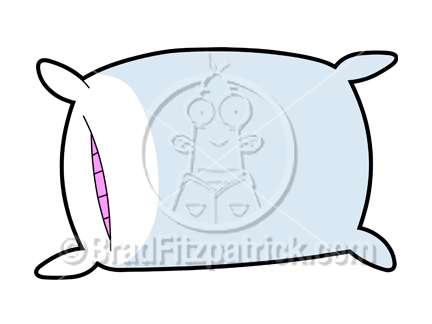 Buddies or complete strangers like to hear the different, random — at times dumb — stories. Prefrenders — pretend friends — give the impression they’re interested, but really just want a chance to tell me: “That’s it? You haven’t even met Brad or Angelina? Tut”, or: “You think you’re cool now, do you?” Yes. You muppet. Not too sure who’s more of an idiot. Me, for answering, or them, for their response. Probably me. Probably. Being honest, I’m no longer a fan of revealing who it is that I am referring to in my stories. Narcissism and all that jazz. No interest in how the writing, DJing or stand-up is going?! “Ehh. Yea– no.” Plus there’s the fact that most of my funnier stories involve my — gasp — lesser-known friends. However, I can appreciate that it’s what people like to hear, so, at times, I indulge. And, other times, I might be asked to write an article promoting my new book. Cheap. Who? Er . . . Playing soccer in Robbie Williams’s house is one that folk like to hear about. Top man. Although we do argue over who takes the penalties. Rob got the last one. His pitch and all. Plus I did owe him for the writing tips and advice I get. Good deal. Duet could be on the cards soon. Must just teach myself how to sing first. Speaking of which, there was that night I did karaoke in a small bar in Hollywood. Maybe a bit drunk. Maybe singing the wrong song. Horrendous. Anyways, straight over to the bar after the last broken note. Guy next to me asked what song I just sung/butchered? Not a clue. Elton John? Fine Young Cannibals? Either way, he agreed: Horrendous. Maybe high notes weren’t my thing. Thought I was Russian. Delighted when I told him I was Irish. Which is when I told him he looked an awful lot like Justin Timberlake. Oh, right. You are. My album of duets is shaping up nicely. I cared. Prince! Purple Rain?! Always the next week. When I might’ve been left high and dry with my high five. Cheers, buddy! A few weekends ago, I decided to go to San Francisco. “Really? I’ve tickets for the Lakers game. Are you sure, now?” No. Not in the slightest. But still. Need a break. Work to do. Arrive back Monday morning. Ask my buddy how he got on. “Great night. Cool seats. Turned out they were VIP. Beckham was in the same box. Nice guy. Pity you missed out.” Not to worry. Always next time. And I could go on and on. But I won’t. So I’ll stop. Need a shower. Feeling pre-tty cheap and dirty after all that. Drip-drop no more! 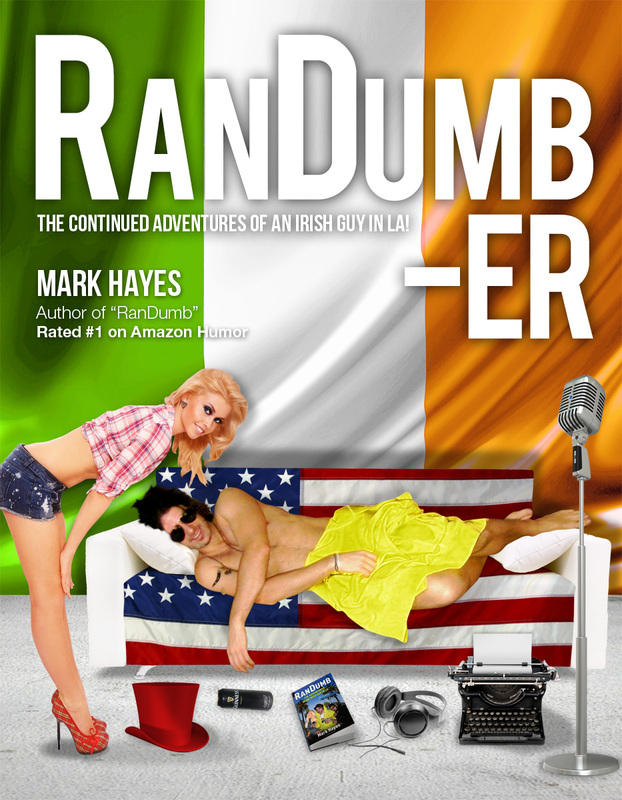 ‘RanDumb: The Adventures of an Irish Guy in LA’, by Mark Hayes is published by Liberties Press, €12.99, and available from http://www.LibertiesPress.com and bookshops nationwide. 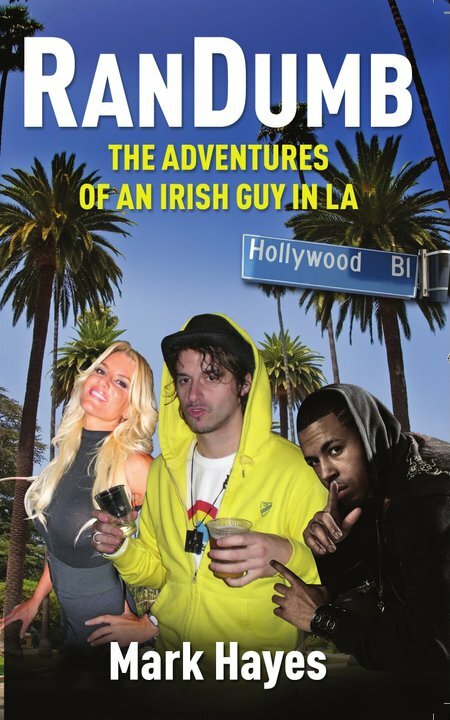 If you want to re-read this bewildering gibber in all its original glory, clickaduu!